For my eight birthday my father had carved three little masks out of pine wood – a man with a pipe, a smiling woman and a little angel singing – the three of us, our small family. One evening I asked him whether he would show me his carving tools, expecting him to refuse as the polished blades were sharp as knives. “Of course,” my father said. “But be careful when handling them as I don’t want you to get hurt.” And then he patiently explained to me how to use a straight and a skew chisel and helped me carve a few lines into a chunk of wood. 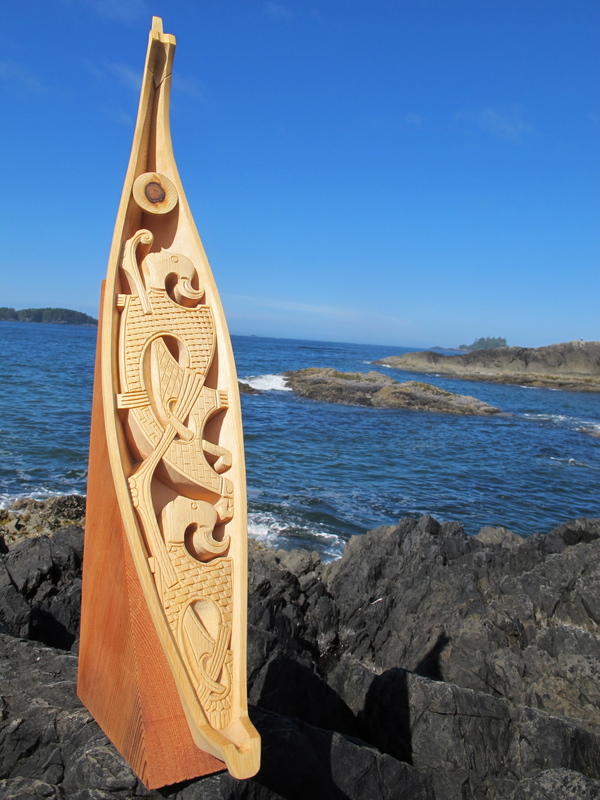 I remember my father’s skill when I meet the European carver Christen Dokk Smith on Chesterman Beach in Tofino. I notice the carver working in the historic ‘carving shed’ on the beach and ask whether I may have a look at his art. “Absolutely, come on in!”, he says. “This must be your calling!” I am looking at the most intricate patterns of his stunning art, fascinated by the precision work and beauty of the pieces. Christen, you were born in Norway, where you grew up in the countryside outside of Oslo. 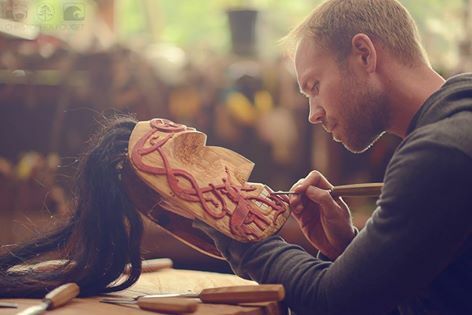 How did you get introduced to Bjarte Aarseth, a master woodcarver at the Vikingship museum in Oslo? Christen: I was attending a meditation workshop and we just happened to sit next to each other on the last day. We started talking and connected, and Bjarte told me he was looking for an apprentice. You were working in the military as an officer at that time: Had you ever thought of becoming a woodcarver at all? Christen: No, but told him that I would accept his offer to visit him at work. When I stepped into his workshop at the museum a few months later, full of the scent of wood, I immediately knew what I was meant to be doing in life – wood carving; it was like coming home. You work in the realm of contemporary Viking carving and sculptures. Are there many European or North American artists like you today who still learn this kind of art? Christen: Not to the extent that I did. My teacher was the 4th woodcarver at the Viking Ship Museum in Oslo, and has since taught two others, myself included. There are other woodcarvers that are inspired by the Viking era and Viking art, but there are only a few that have the in-depth knowledge of Viking carving that I do. During your 4 year apprenticeship, what did Bjarte train you in? Christen: I was given a thorough classical education in woodcarving, where knowledge is passed down from master to apprentice. Bjarte had high expectations of me and not only did he want me to learn the different styles of carving but he wanted me to master them. My main focus was making high precision replicas of the Viking artifacts for the museum, but I was also taught Norwegian Medieval style, Baroque acanthus, Rococo and sculpture. Can you tell us a bit more about the classical European way of carving? Christen: From my perspective, the European way of woodcarving has always focused on architectural decorative elements, which was used on castles, cathedrals, churches and other grand public buildings. There was more of a craft approach than artistic approach to carving and the craftsman were bound to the rules of the era, with no consideration for artistic input. 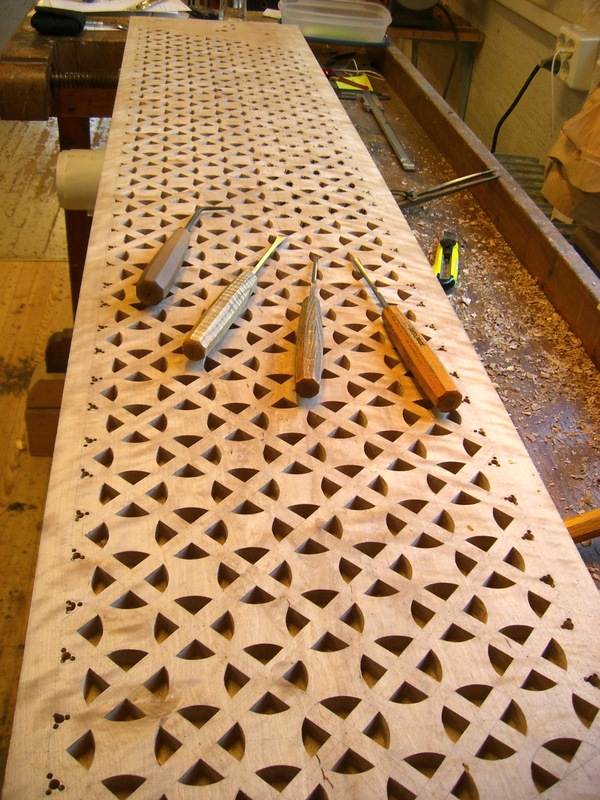 Your carvings are intricate – they must take months to produce. Is there any room for error when you work with wood? Christen: When I worked for the museum, there was no room for mistakes. But as we had plenty of time, we never carved if we had a bad day or felt stressed. Bjarte always emphasized being mindful and focused on what you were doing. If we had made a mistake we would have to start over again. As an artist I still try to maintain this approach to carving; of course when I’m not bound to making a replica of something I have the advantage of adjusting the design should I make a mistake. What are the differences between Viking, Medieval, Baroque and Rococco carving? Christen: That is a big question that could be the theme of a book. In short: the difference lies in the time period the carving was made, and the design elements employed during that time. We regard the Viking era to be between 750 – 1050 CE. The carvings are intricate, often depicting disjointed creatures that bite or hold onto one another. Viking carving is often mistaken for Celtic design. Isn’t there a strong resemblance between them? Christen: Yes, but Celtic carving is symmetrical, whereas Viking carving is very asymmetrical. In Norway, the medieval era started when Christianity was brought to Norway (around 1050CE), earlier on the continent. Today, we have a couple of wooden churches – called Stave churches – left from that period. The carving became a bit more symmetrical during this period. It usually depicted serpents and dragons, again intertwining and biting each other. Later on in the era the animals were replaced with flowers on long stalks intertwining. The Baroque lasted between 1600-1700CE and is characterized by a very strict construction of the decorative element and was often built around the Acanthus plant, a Greek broad leaf plant with sharp edgy leaves. This particular style of carving was brought to Norway by a Dutch carver, who was hired to decorate the cathedral in Oslo when it was built in 1694CE. The Rococo period replaced the Baroque era and lasted to the end of the 18th century. The period was a reaction against the Baroque and was more playful and used more asymmetrical designs and curves. Often incorporating a shell. What kind of wood do you use and why? Christen: I use all kinds of wood. I tend to prefer the harder types of wood like birch, maple, oak, wood from fruit trees, and walnut. Lime wood is a very soft wood but takes details well. Working for the museum we always used the same wood as the original artifact we were replicating (mainly oak, birch, ash and beech). After relocating to BC, I began using a lot of yellow cedar, alder and some red cedar. Even though it is not always possible I try to source salvaged wood for my projects. Regardless of preference, the wood I use has to suit the product. If I were to make a piece that is meant to be outside, I would have to use wood that can withstand moisture and does not rot easily, harder wood is preferred for products that are meant to be used or will be touched a lot. Is the art of making high precision replicas for the museum still being taught today? Christen: There has not been another apprentice at The Viking Ship Museum since I left. I have yet to come across another museum that has a woodcarver employed for that reason, though I am continuing to look! Tell us a bit more about the subjects you choose and the materials you work with. When you received a scholarship at the City and Guild of London Art School, you started focusing on your big passion – sculptures. Christen: Yes, I have focused on making portrait work. I have replicated several sculptures. At the City and Guild of London art school I made a bust of Michelangelo’s David. My last project in Norway before I moved, was making a copy of a 13th century Madonna with child. The Madonna was carved out of one piece of oak, 4 feet tall. I have also done several sculptures of live models or bust portrait work. One of my main projects this year is a sculpture of “a boy in wonderment of the world” in maple for the OneTree Project. The show will take place at the Robert Bateman centre in Victoria in November 2015. I’m also in the planning process for a series of sculptures that are inspired by my inner growth and personal development, where I will use myself as a model. The series will probably be in red cedar. In 2012 you moved to Tofino. Have you been working a lot First Nation carvers? If so, who has inspired you the most? 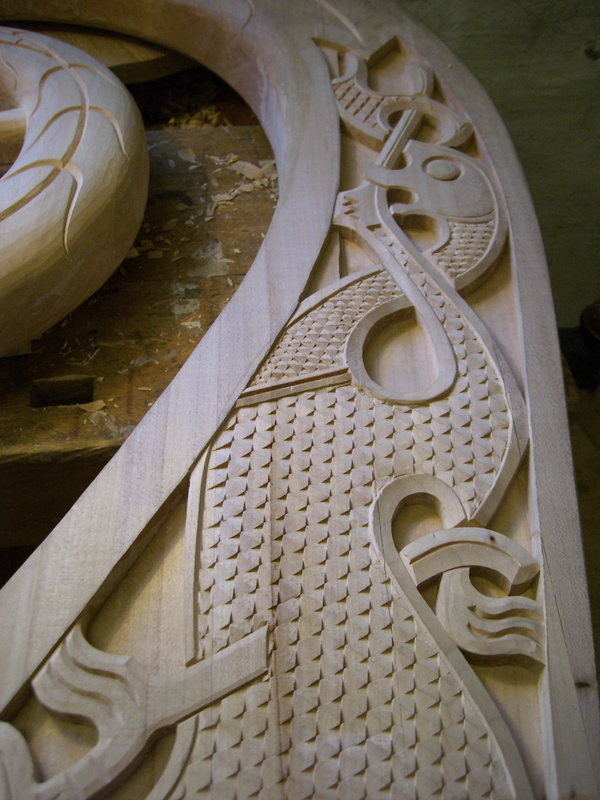 Christen: My introduction to First Nation carving came on one of my first trips to BC, prior to moving here. 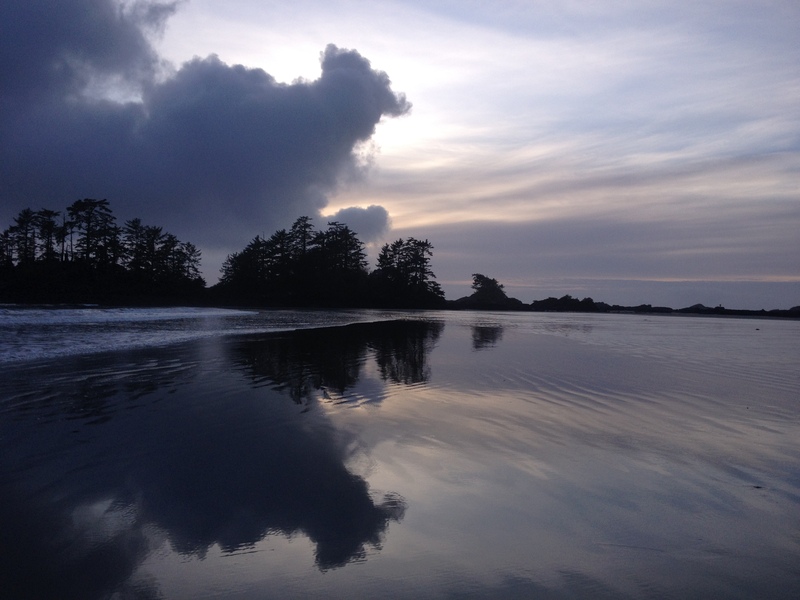 I had been put in contact with a First Nation elder – Levi Martin – in Tofino. In our time together he guided me to create Pok Mus maks (Wildman mask). The most important thing he taught me – which still remains part of my practice today – is to sit with the wood and listen. To let the wood speak. When I moved here, I met Joe David who became my mentor and friend. Joe taught me to respect the old way and techniques and we meet on a regular basis to discuss what we are working on and wood carving in general. I am very inspired by First Nations art, not necessary their form line, but more the presence and energy that some of their art work has. It has opened me to another dimension in carving. You have been carving from the “Carving Shed” on Chesterman Beach in Tofino ever since you moved there. What’s the story behind ‘the shed’? Christen: “The Carving Shed” was built by a Spanish/ Swedish carver named Henry Nolla, who came to Canada in the 50s. He was allowed to build a shed on the McDiarmids land in exchange for taking care of their house in Tofino. When they later built the Wickaninnish Inn, Henry did all of the decorative adze work and the front doors to the Inn. Henry was that type of person who attracted other people, so when he passed away 10 years ago his fellow carvers continued to work form there. The Inn saw the opportunity for a mutual beneficial relationship where their guests could experience an authentic work shop on the beach, listening to the story of Henry Nolla, and we – the carvers – would have an amazing work place. As Feather George, the caretaker of the shed, really liked my work, I was invited to join him. So, today it is only the two of us working there. You have participated at the carving in the Edge Festival in the past, is that right? Christen: Yes, the Edge Festival is a local woodcarving festival here in Tofino for the last two years. Both presenting my work and giving a talk. The first year I talked about Viking art and carving, and last year I talked about my journey. Any upcoming events? You will participating at the OneTree Project in Victoria in November this year! Christen: Yes, the oneTree exhibit project will promote the fascinating interrelationship between art and nature by celebrating the past, present, and future of one particular Bigleaf Maple tree by salvaging its wood, making functional art from it, and recording the creative process. It is going to take place at the Robert Bateman Centre in Victoria BC this November. Christen, thank you very much for sharing your thoughts with my readers. 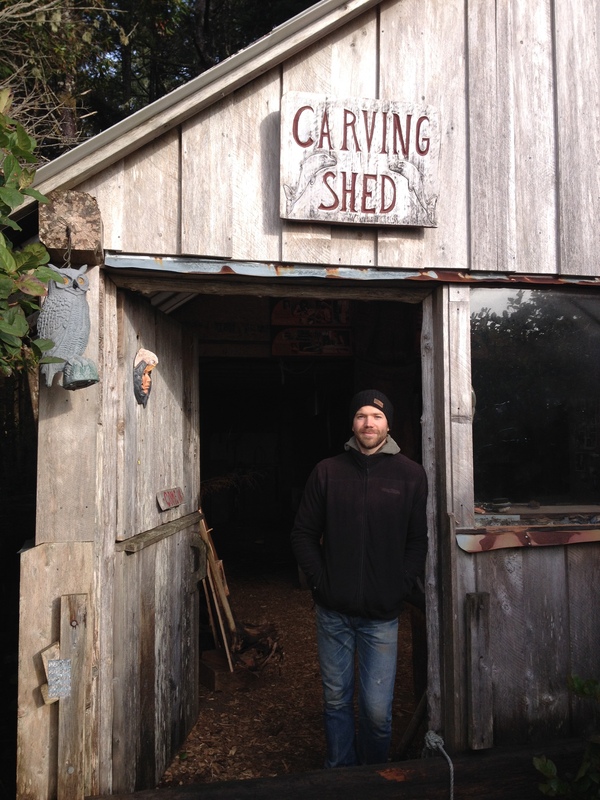 Christen Dokk accepts commissions related to decorative carving, portrait and sculptural work. This entry was posted in BC Artists, Galleries, Sculptor, Sculptures, Uncategorized, Vancouver Island, Victoria BC, Wood engraving, Woodcut and tagged alder, birch, Bjarte Aarseth, cedar, Christen Dokk Smith, craftsman, First Nation carvers, Henry Nolla, Levi Martin, Norwegian carving, oak, One Tree Project, Robert Bateman, The carving shed, Tofino, Viking carving, Viking Ship Museum Oslo, Wickaninnish Inn, Wood carving, Wood replicas. Bookmark the permalink. I love wood carving /always have wanted to do it/so glad you found it and are are keeping the scent of the wood viking hand carving alive. Im an artist of a different kind / viking inspired living in the thick of life with the plants the animals and the people art in Alaska USA/Ive been to Norway to the viking museums stave churches etc/love it!